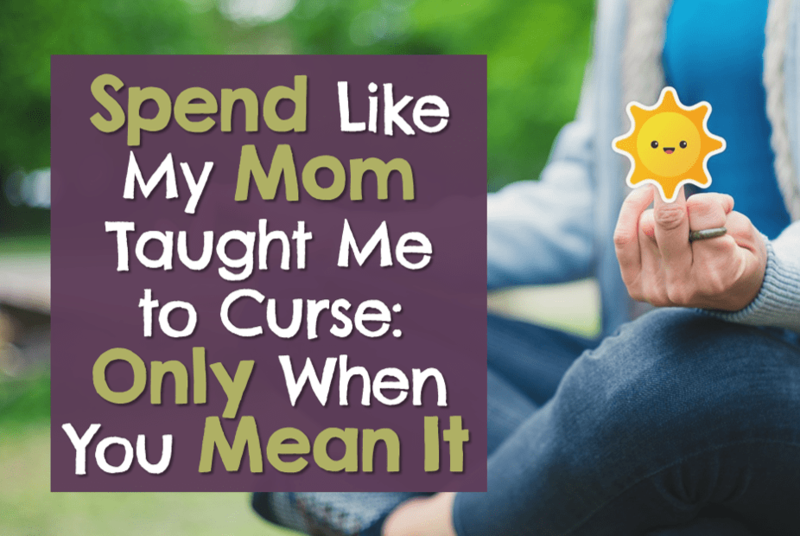 Spend Like My Mom Taught Me to Curse: Only When You Mean It | Good Life. Better. Note: this post contains curse words. Please stop reading if you take offense at such words. Or if you are a little kid. And especially if you are a little kid who takes offense at such words. A few weeks ago, a friend shared a story about getting super frustrated about something and accidentally cursing in front of his young son. He apologized immediately and explained to his son that the word he had said was a bad word and he had been wrong to say it. The son listened intently and nodded his head signifying he understood it was a bad word. You know what comes next, right? Of course, the son promptly started saying that word because that is what kids do! In addition to making me chuckle, the story made me think about my own parents cursing in front of me. Specifically, my mom (I can’t recall my dad cursing—he tended to just bite his lip when he was frustrated). As I shared here, my mom was not a kind person. She was masterful at making all of her kids feel inadequate and just generally unloved and unlovable. She created a toxic atmosphere that I hope very few people have first-hand experience with. If you do, my advice is to find a good therapist. But while there is no doubt she sucked at being a parent, she had skill when it came to cursing. When my mom cursed, she didn’t just use one curse word but three strung together, always in the same order: Hell, Sh*t, and Damn. And she would draw them out for maximum effect, as if she needed to really appreciate how her mouth and tongue moved to form the words. When I was about twelve, I remember asking her about her cursing. Most of my friends’ parents didn’t curse around them so the fact that she did around us stood out. Her response? 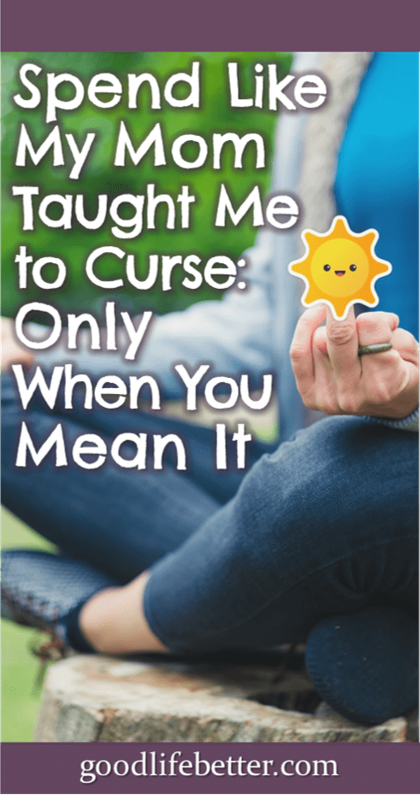 Cursing was okay but only if you really mean it. What the F*** Did That Mean? At twelve, I’m not sure I understood what she meant. I hadn’t really developed the habit of cursing at that point so in the rare instances I did curse, I meant it. But then, during my last year of undergrad, I student taught at a local high school and her criteria for cursing suddenly made more sense. As an English major and teacher, there are so many great adjectives available to describe a party, or a hamburger, or whatever it was they wanted to describe. Curse words can be in the mix but they are most effective when they truly are the best words for a given situation. What Does This Have to Do with Spending Money Intentionally? Just like cursing indiscriminately reduces the ability of these words to convey meaning, spending indiscriminately devalues your money too, making it that much easier to spend it on a whim and for things that you will undoubtedly come to regret purchasing. Five dollars here, ten dollars there and boom, your paycheck is history. I remember when it was rare I would get $40 in cash back but I recently realized that $40 is the new $20 when it comes to ATM withdrawals. The good news? Just as you can (mostly) refrain from cursing in situations where you shouldn’t (like in front of your kids or possibly at work), you can also cultivate the habit of spending only when you mean it too. Here’s how. Have you ever caught yourself right before dropping an F-bomb and managed to change course? I know I have. Sometimes it’s because of the company I’m in but other times, it’s because it really isn’t the best response to the situation. When it comes to spending, use the same self-awareness that keeps you from using curse words unless they are truly warranted to resist spending money on things you don’t need (or maybe even want). Just as you have control over what you say, you have control over how you spend. As I shared in I’m Living Frugal With 40+ Pairs of Shoes, when I think of being frugal I think of prioritizing buying only what I need instead of trying to spend as little as possible by, among other things, cutting my own hair, buying second-hand clothes or shopping in the soon-to-be-expired meat section. That same interpretation of frugality works here too: spend money on what you need and not on what you don’t. I know what you are thinking: this doesn’t help because need is subjective (not unlike how deciding a curse word really is appropriate for the situation will depend on the individual). But even if what one person needs is different from what another person needs, one thing you can’t argue with is that not everything is a need. In my case, traveling is a priority for me. It makes me happier in ways a designer handbag never will so it is something I am going to spend money on. This means if you run into me while I am visiting friends in England, I will most definitely not be carrying the latest style of handbag (but I will likely be laughing!). Even though my mom readily cursed in front of us, I don’t remember her ever saying the word “f***.” I think in her mind that was one step too far. When it comes to spending, even within the categories I consider needs, there are lines I can’t imagine crossing too. For example, I just don’t see myself ever buying a first class plane ticket. This isn’t to say I would turn down the opportunity to fly first class. But to spend that much money so I am moderately more comfortable for a, relatively speaking, short amount of time? I have a hard time wrapping my head around ever doing so. How Do You Plan to Start Spending Only When You Mean It? What tricks do you think will help you be in the moment and resist spending indiscriminately? Let me know in the comment section below. $40 is the new $20 at the ATM?? I guess I basically NEVER withdraw cash, so now I’m curious if you can still even get $20 “fast cash” that way. You know–I don’t know. I’m usually so paranoid at the ATM I want to type everything in instead of relying on the fast cash option (probably annoying the people behind me). What a fun concept, spend money the same way you curse, only when you mean it! Thank you for the compliment–given how hard it can be to adopt a habit, I am all for making one we have already mastered do double-duty! And I know what you mean about cash and ATMs. Those fees can be brutal!